Paytm serves Indian consumers and specifically Indian consumers who use mobile phones. Why is this important? Vast areas of India are underbanked and have a cash economy. In this case India is like Kenya where M-Pesa evolved to solve a similar problem. The pain that many people felt was that moving online and digital provided them with many opportunities, including the use of their mobile phones. However, for young people it was difficult to open a bank account and pay for the services with a credit or debit card. Similarly paying for phone data at a shop or street stall was time consuming and a poor customer experience. Neither allowed easy online payments. Much of this was due to the licence raj, a cumbersome system of centralised control and bureaucracy that stifles innovation in many sectors . Paytm’s initial value proposition solved this problem of under-banking and difficulty in recharging by providing a platform that was incredibly easy to use to top up mobile phone credit. This focus on usability meant that Paytm became more popular than the websites of mobile operators for phone recharging. This is an important point. The core value that Paytm offered here was not that you could top up or recharge. Rather it was that it was so easy to do. It de-frictionalised a cumbersome process. The second part of the value proposition was then to turn this into a parallel banking system. There is no good Western equivalent. PayPal offers similar services but 99% of it’s users have a bank account. In 2010 65% of Indians did not. This comes with huge network effects. Paytm becomes far more valuable to its users as more people use it. Paytm has faced an educational problem in persuading customers to try its novel electronic payments system. As a result, it has had to use a variety of channels. The most important of these were the partnerships that it established originally with mobile providers. In their billing they offered Paytm as an option and this allowed Paytm to reach millions of customers at low cost quickly. Each additional payment customer added large numbers of users and increased awareness of non-converted Indian of the ubiquity of the platform. Paytm invested heavily in cricket and TV advertising. This clearly created awareness and provided credibility to the brand as it drew on the status of existing advertisers of major sporting events. Paytm does not do customer relations with its users. It has no telephone or publicly available email or chat functionality. This is common to other ecommerce sites which focus on driving down their cost base. 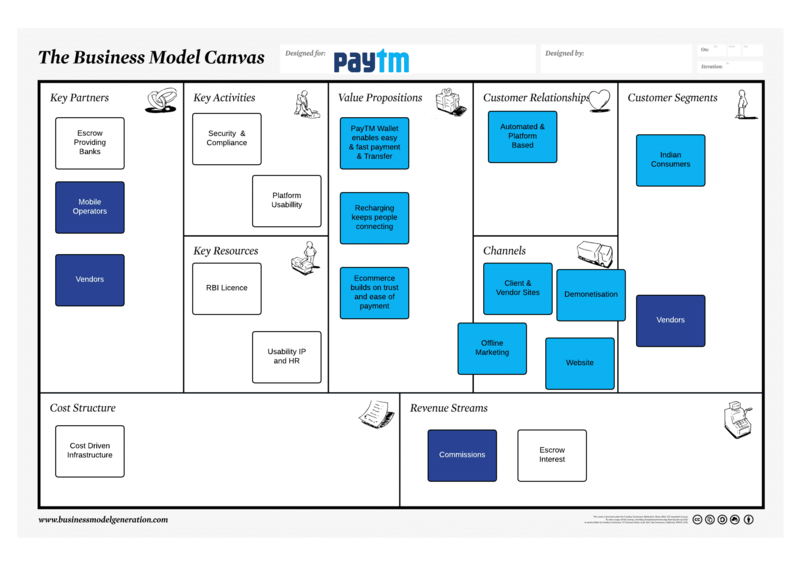 Paytm has several different revenue models. These can be grouped into two classes. Firstly, it makes commissions on many of the transactions that customers use the platform for. These are generally paid for by vendors rather than the users directly. The goal is to decrease friction and encourage more use of Paytm. The other major revenue source is the interest that Paytm makes on it’s escrow accounts. When customers load their digital wallets Paytm banks this money in short term money market accounts. Whilst it has no right to the underlying capital it offers customers no interest and so as it grows it has substantial amounts of capital under management. The key resources that Paytm has are its Reserve Bank of India licence and the design/software culture around designing applications that are easy for hundreds of millions of poorly educated Indians to use. The RBI licence is critical. This is an unusual banking licence in India and seems to be specific to Paytm. It has allowed it to bypass substantial levels of regulations and acts as a barrier to entry for other competitors looking to imitate it. As a payment provider Paytm is exceptionally vulnerable to fraud and security risks so it has to take significant efforts to prevent fraud and protect customers money. It is also involved in continually improving the platform to encourage use and take a larger spare of consumers digital wallets. Paytm’s key partners are the banks that provide it with escrow services and payment gateways into the traditional banking system. It is starting its own banking operations to reduce this dependence. Again, like Souq, Paytm is very cost driven. The platform is designed to deliver services at scale with new customers being served at close to zero additional marginal cost. The most expensive are the platform and the cost of new customer acquisition. Like many ecommerce businesses the cost to acquire a customer is significantly higher than the revenue made on the first or even third purchase. The largest cost going forward will be the compliance requirements for fraud and security with over 65 million customers having gone through the know your customer process to help avoid money laundering.